To neglect your church, your prayer, your Bible study, your devotions, is to tell God that you have no desire to grow, to become more and more His child, that you are satisfied with being a weak and shaky Christian, and that you have had as much as you want from Him. How perilously such a person is slipping away from God. Everything that is not in accord with God’s will is given over to death and the power of darkness. These words preached nearly sixty-three years ago still ring true for Christians today. During this Lenten season, the words of Dr. Nagel should bring comfort to those who in these forty days of preparation “cling to Christ and His Word” and pursue the will of God found in the death and resurrection of Christ Jesus. This year, the Rev. Dr. Norman Nagel turns ninety-three years old. Selected Sermons of Norman Nagel: From Valparaiso to St. Louis shares but a glimpse of the sermons he preached in his fifty-three years of public ministry around the globe. These sermons remain a gift to the Church and world and a priceless resource for pastors and laity alike. Interested in reading more sermons by Dr. Nagel? Order Selected Sermons of Norman Nagel: From Valparaiso to St. Louis from CPH. 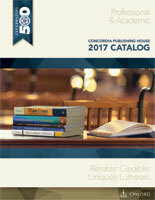 Selected Sermons of Norman Nagel: From Valparaiso to St. Louis, copyright © 2004 Concordia Publishing House. All rights reserved.